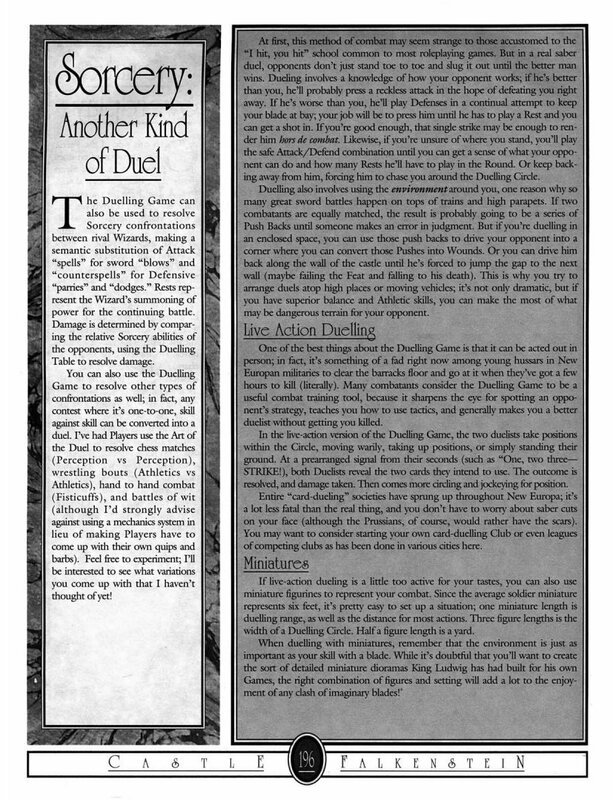 Report of first playtest of Do: Fate of the Flying Temple. Report of first playtest of my Fate of Falkenstein hack. Review of the online classes, which are very interesting. 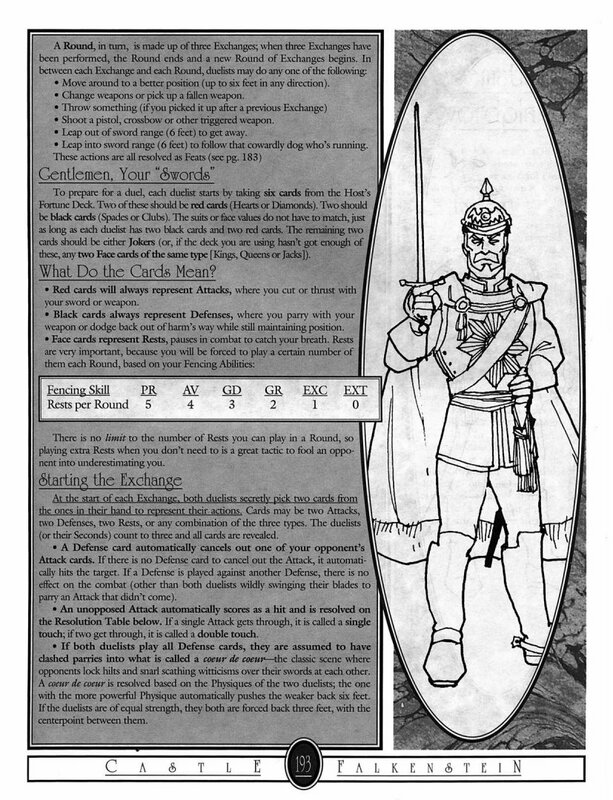 My latest Fate hack idea, adapting the world of Dragaera from Steven Brust’s Vlad Taltos and Khaavren Romances series. More on hacking Fate Core (Evil Hat Productions) to play Castle Falkenstein (R. Talsorian Games) (see previous posts). In what is possibly the last item to convert, I’m musing about how to translate vehicles. If you want to use the rules from Castle Falkenstein pp. 190-191 and 208-215, the main change to make is to replace the damage system. In CF, the damage caused by infernal weapons and the number of “wound” points equipment receives is based on size and on building materials, as shown in the tables found on p. 191 of Castle Falkenstein. Instead, I suggest using the advice sketched under the “Extras” section in Fate Core and under “Subsystems” in the Fate System Toolkit. In short, it means applying the Fate Fractal to these contraptions and treating them like characters by giving them aspects, skills, stunts, and even consequences. Here I’m going to leave things sketchy because, to be honest, I’m not interested in writing a series of rules for how many aspects vehicles should have based on size, or how many consequences they should be able to take based on construction materials. In truth, this is all irrelevant; what matters is how important the vehicle or weapon is important to the story—or even how important a particular characteristic of the vehicle or weapon is to the story. For example, 20,000 Leagues Under the Sea features numerous ships, even war vessels, but it really doesn’t matter how big they are; what matters is that they are sunk by the Nautilus. Assign two to five aspects to vehicles and infernal weapons that are important to the story, starting with a High Concept and a Trouble. The Castle Falkenstein pp. 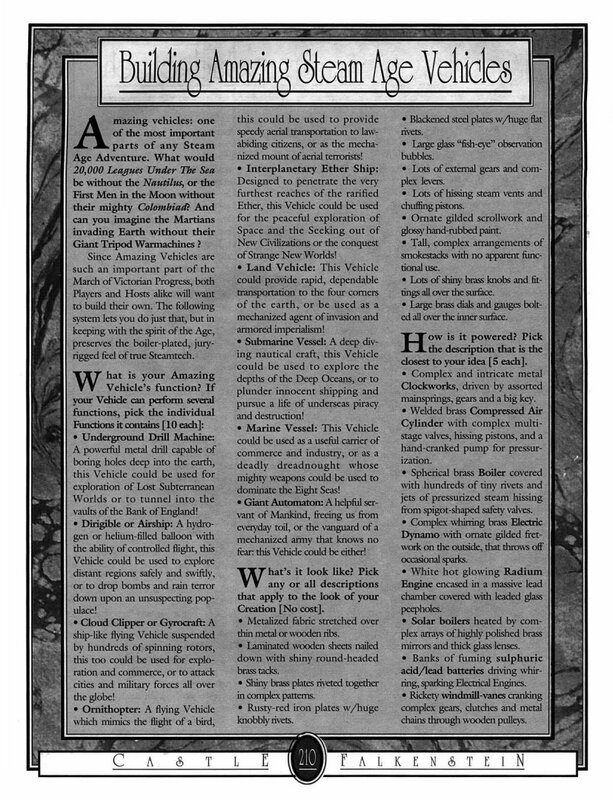 210-215 vehicle and weapons creation rules are well-suited to suggesting some aspects. An oft-used vehicle with story value that can act independently might be assigned appropriate skills such as Motoring or Helmsmanship, Marksmanship, Stealth, or Perception. If there is going to be combat with other vehicle or weapons in the same general class size, give one or more consequence slots. I recommend using the advice in the Toolkit: an average vehicle—3 or fewer aspects—can take one mild consequence; an exceptional vehicle—4 or 5 aspects—can take one mild and one moderate consequence; and a vehicle with an aspect like Rugged or Military Grade may be able to take one severe consequence. 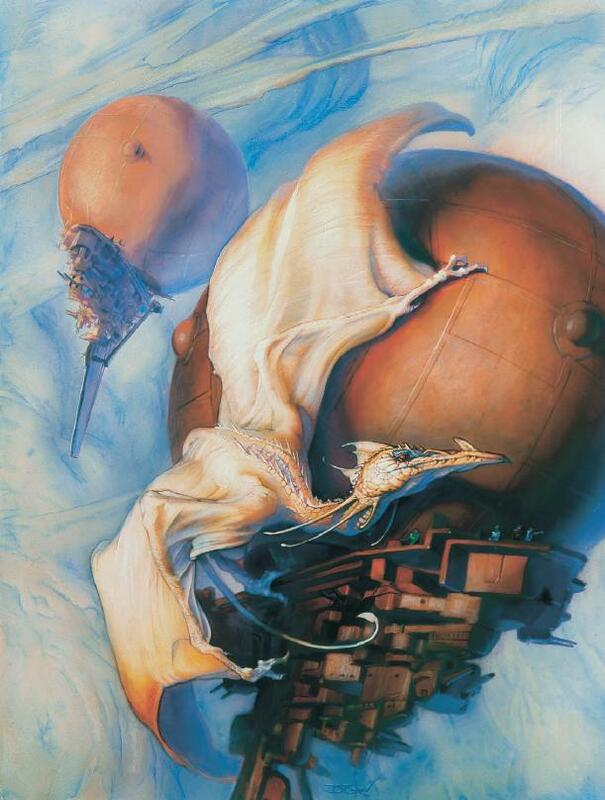 If the vehicle is going to be the player characters’ mobile base or one of their important advantages, for example if the heroes are going to be ruling the skies on their own airship and fighting Robur the Conqueror and his air pirates, the skill ranks, stunts, refresh, and aspect slots can be invested by invested by several characters. Size as described in Castle Falkenstein can be ranked on the Fate ladder. The numerical modifier may not be used depending on the way the vehicle is treated in the story, but at least it provides a relative comparison between different vehicles. The group wants to play the crew and passengers of an airship from the Free State of Orleans. The airship is going to be important to the story and PCs so she gets a good deal of attention. The private merchant airship Nuage d’Or is the pride and joy of her captain, Jean-Michel du Pont-de-la-Vierge. She’s one of about 30-40 merchant class ships built by the North during the American Civil War. Some of them were captured by the South and after the war a few were bought by folks in the South. Number 24 of the series, the Pride of Akron, was confiscated when her owner neglected to pay certain “taxes, fees, and considerations” (read “bribes”). Jean-Michel paid what was necessary and renamed her Nuage d’Or. After purchasing her, Jean-Michel brought a few modifications to the Nuage d’Or: three Gatling guns (one forward starboard, one forward port, one aft centre), and light armouring overall (including some on the external gasbag envelope). “Light armouring” would normally stop smaller calibre bullets, probably Gatling gun bullets as well, but definitely not an artillery shell. 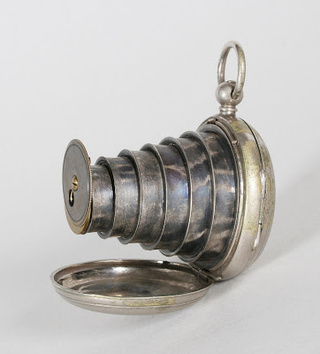 The armouring is concealed and the guns are kept very low profile. Function: A hydrogen-filled airship with the ability of controlled flight that can be used to explore distant regions safely and swiftly. Looks: Metallized fabric stretched over thin metal and wooden ribs; hissing steam vents and huffing pistons; ornate gilded scrollwork and glossy hand-rubbed paint; lots of shiny brass knobs and fittings; large brass dials and gauges. Powered by: Boiler powering a Steam Engine. Controlled by: A complex arrangement of Levers, Cables and a Captain’s Wheel. Moves with: Shiny Propellors on Intricate Shafts. 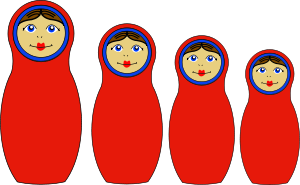 Size: Large (crew of 21), a.k.a. Fair [+2]. Permissions: None; understood as part of the game’s premise. Costs: Skill ranks, refresh, and aspect slots, invested by several characters. Aspects: High Concept: Private Orleanese Merchant Airship; Trouble: Her Previous Owner Wants Her Back; other aspects: Gatlings Guns; and Extra Compartments and Passenger Quarters. 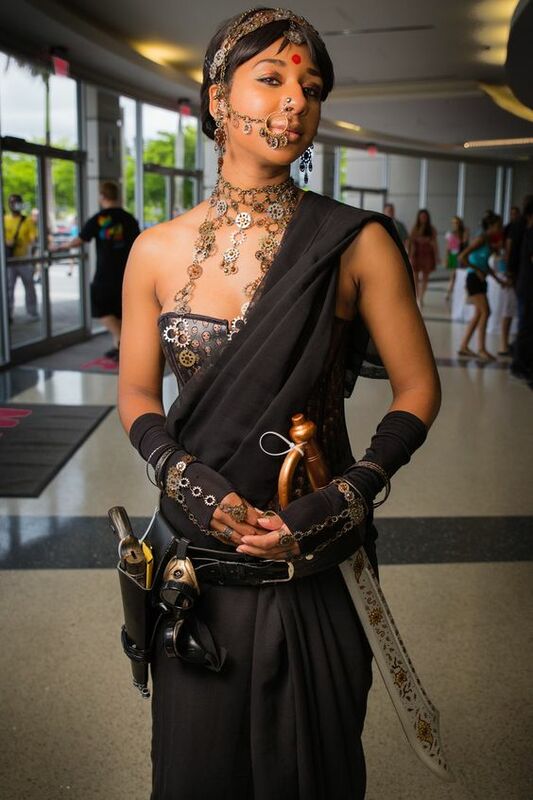 Skills: Good [+3] Flight (equivalent to Helmsmanship); Fair [+2] Marksmanship. Stunts: Park on a Dime. The Nuage d’Or gives +2 to Flight or Helmsmanship tests to access and moor in difficult locations. Stress: Two minor consequences (thanks to the armouring), one moderate consequence. 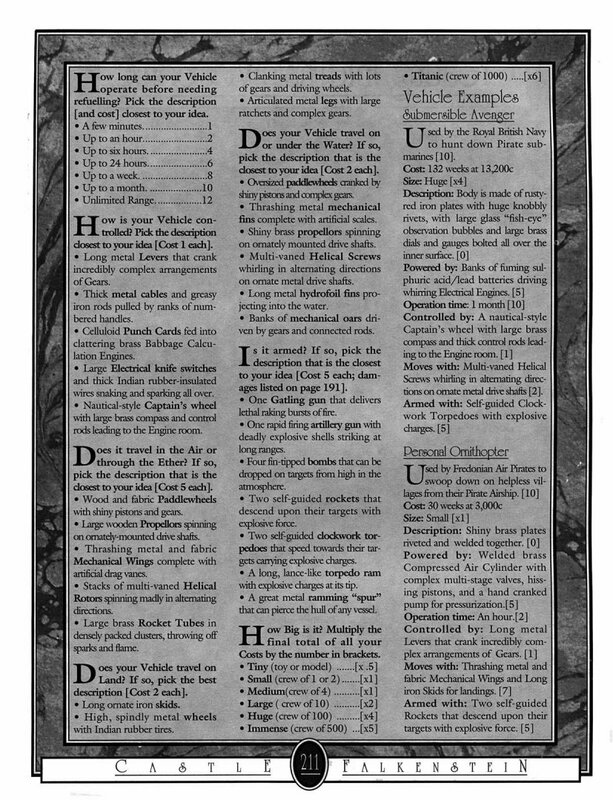 Finally, if you want more detailed rules for large vehicle combat, I recommend you read Rob Wieland’s rules for mech armour in “CAMELOT Trigger,” one of the settings offered in Fate Worlds Vol. 2: Worlds in Shadow (Evil Hat Productions). More on hacking Fate Core (Evil Hat Productions) to play Castle Falkenstein (R. Talsorian Games): Victorian gadgets! Castle Falkenstein pp. 190-191 and 208-215 covered engines of war, gadgets, anachrotech, inventions, mad science, Engine Magick, and vehicles. In addition, the supplements Steam Age and The Lost Notebooks of Leonardo da Vinci expanded considerably on this. These rules are actually quite simple and can be used without much change; however, they are not very “realistic.” Do we care? That depends on the group. 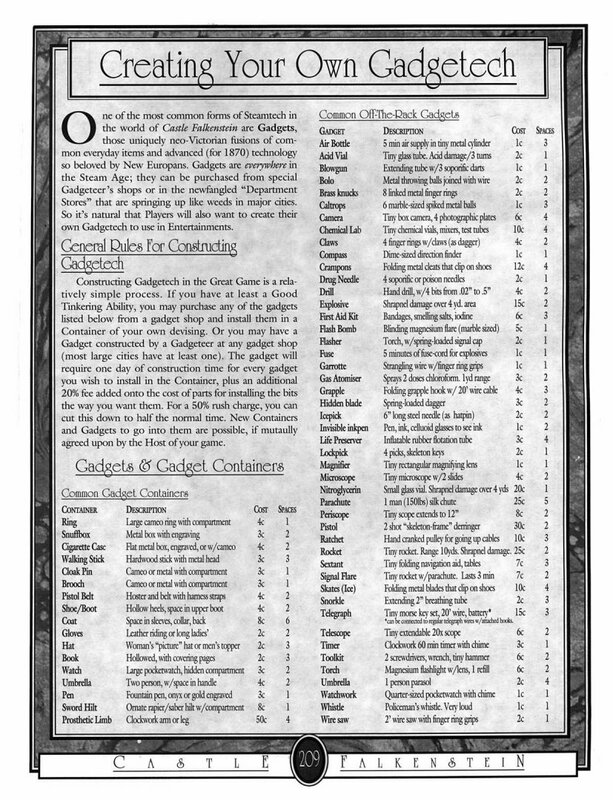 If you want simple plug-and-play gadgets that have limited use in the story and are just the means to an end, you can get them off the rack, or just about, by using the rules from Castle Falkenstein p. 209: pick a common gadget container from the left-hand column, and pick one or more off-the-rack gadgets from the right-hand column to fill the available spaces; pay the required price. 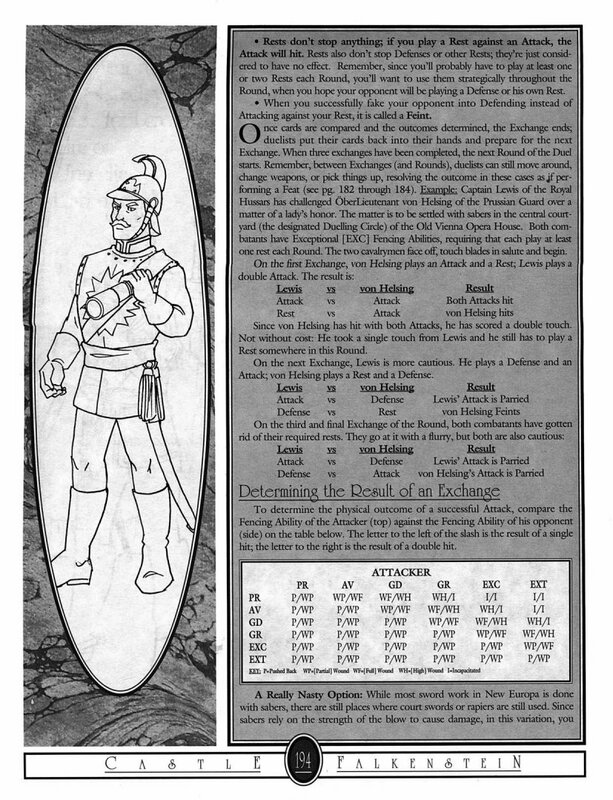 More on hacking Fate Core (Evil Hat Productions) to play Castle Falkenstein (R. Talsorian Games): time for a swashbuckling duel! More on hacking Fate Core (Evil Hat Productions) to play Castle Falkenstein (R. Talsorian Games): gear, weapons, and armour or lack thereof. As I discussed a couple of days ago, I’m not enthusiastic about just assigning damage point values to weapons. 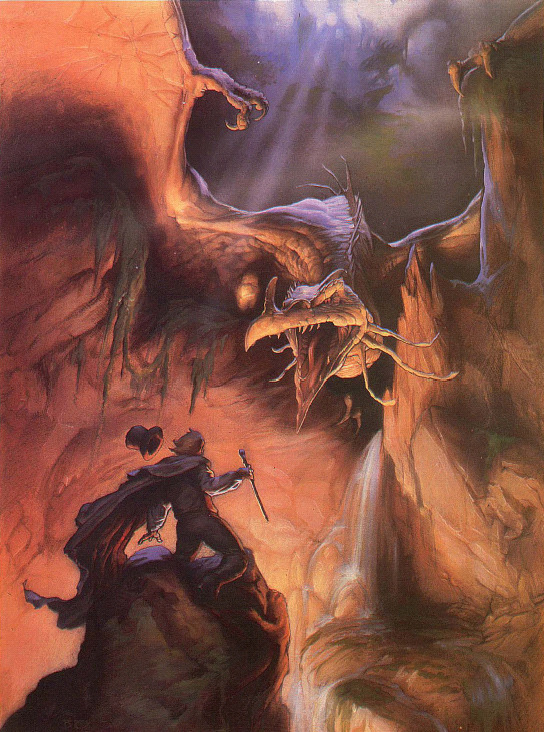 While it’s a fitting approach for a number of games—David Goodwin gave us an overview of a D&D-type approach yesterday—I don’t think it fits with the spirit of the fiction of Castle Falkenstein, regardless of whether it fits with the feel of the system in CF. Decide what you’re trying to accomplish first, then consult the rules to help you do it. The meaning of weapon rules in New Europa is very different from what David used yesterday for his discussion, for example. They’re not about the players’ shopping experience (to use a simile from Robin’s Laws of Good Gamemastering), nor realism, nor even much about tactical play. What are the reasons to differentiate weapons in the Falkensteinian world? As we might expect, they’re all about supporting the fiction. 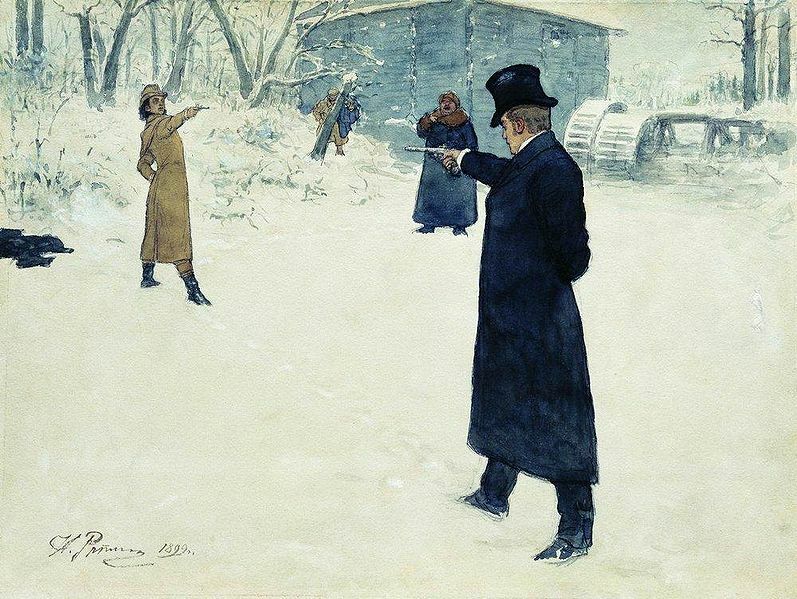 To provide the appropriate sense of danger whether threatened by a reciprocator pistol, a hatpin, or a sabre. To differentiate character concepts in action: the duellist from the suffragette from the anarchist, for example. 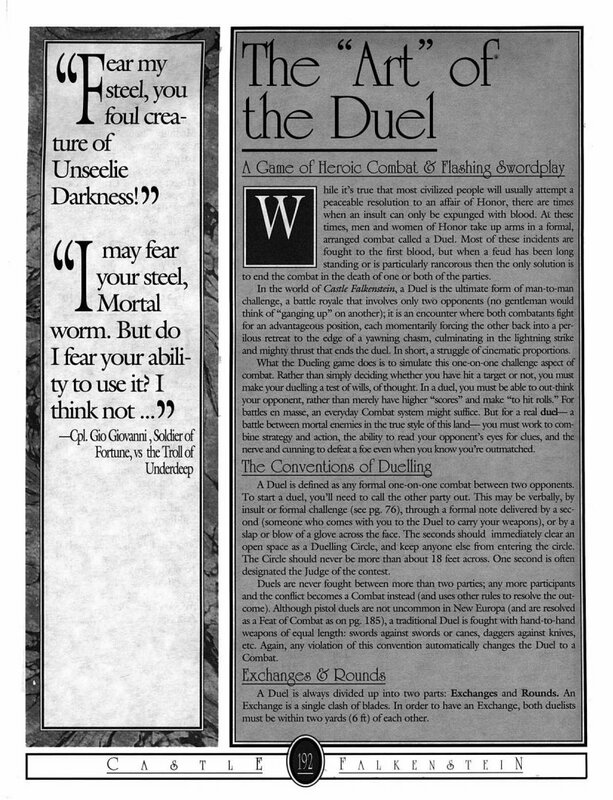 To provide a sense of the disparity between the very large and the very small which marks the setting, from ancient Dragon Lords to gallant pixies and from weapons of mass warfare to single duels. To provide variety in the Grave Perils faced by the heroes. 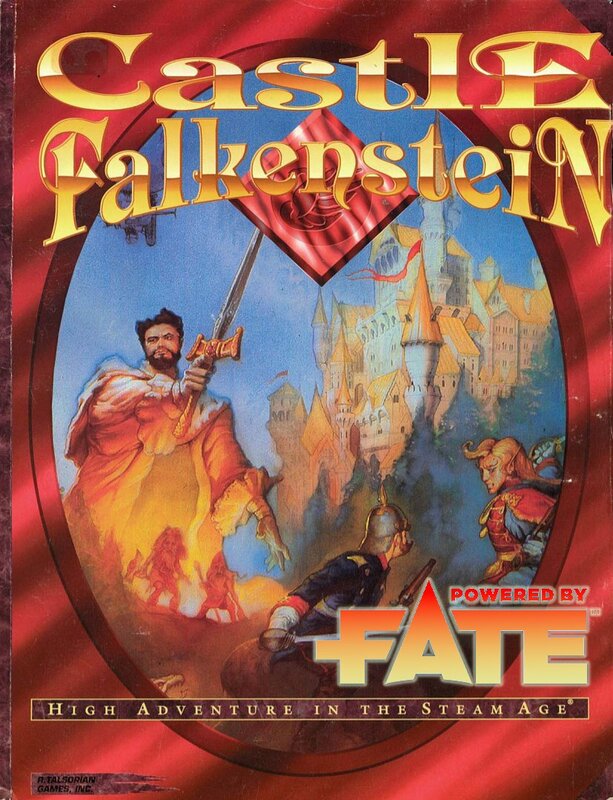 As I’m hacking Fate Core (Evil Hat Productions) to play Castle Falkenstein (R. Talsorian Games), I realise that I should have started at the start and celebrated the reason this game is a beloved memory for so many gamers 20 years later: author Mike Pondsmith and artist William Eaken. Mike and his family are R. Talsorian Games. That means, for you youngsters, the various editions of Mekton, Cyberpunk, Teenagers from Outer Space, and derived titles. And Castle Falkenstein. 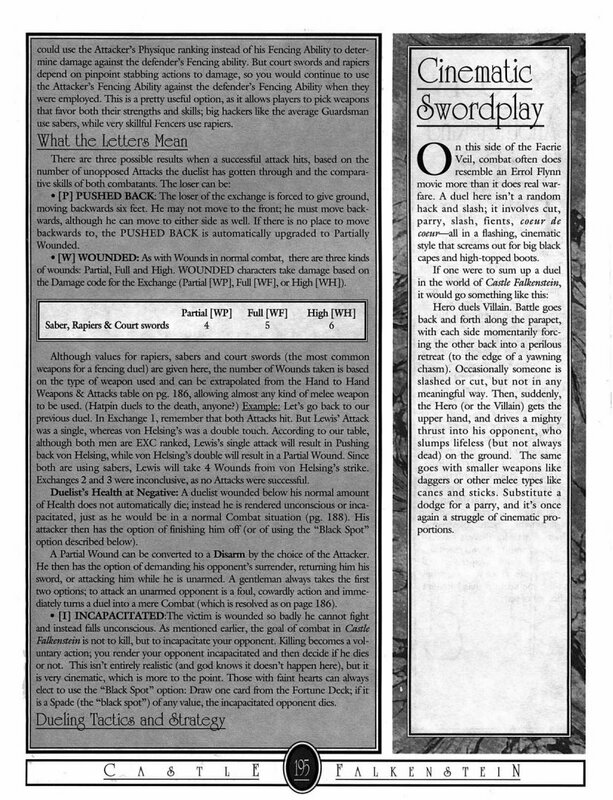 When Mike gave us Castle Falkenstein in early 1994, we had had some lavish games already, particularly West End Games’ Star Wars RPG and the black and white elegance of some of White Wolf Games’ main titles, but Castle Falkenstein was the most beautiful role-playing book I’d ever seen at the time. I fell in love with it. Mike Pondsmith’s personal vision is all over that book and its supplements. His training and experience as a graphic artist in the video world gave him a very 3D, fluid, walking-through, you-have-to-be-there vision of game worlds, while we were still in static 2D in most of the pen-and-paper RPG community Mike did (and still does, as far as I know) most of the graphic design and layout work on RTG products, and in Castle Falkenstein he decidedly took his work to new places. He also gave us a game that was neither a random-roll, crap-shoot heartbreaker character creation dinosaur like the ones we had grown up on, nor a point-based, accounting exercise like the second-generation RPG of the time. 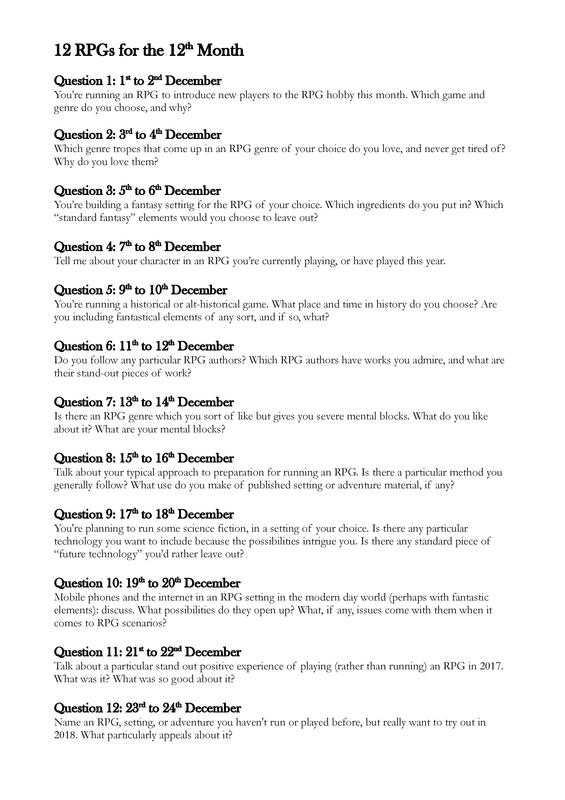 It was friendly, math-light system that cared about narrative first (you started by writing your character’s diary!) It turned out to have math problems anyway, but it was a good idea that only needed some tweaking. The third thing that made the game stand out was the separation of fiction and mechanics; the game provided ample source material that was unencumbered with stats, so you could marry it to another system of your choice quite easily. 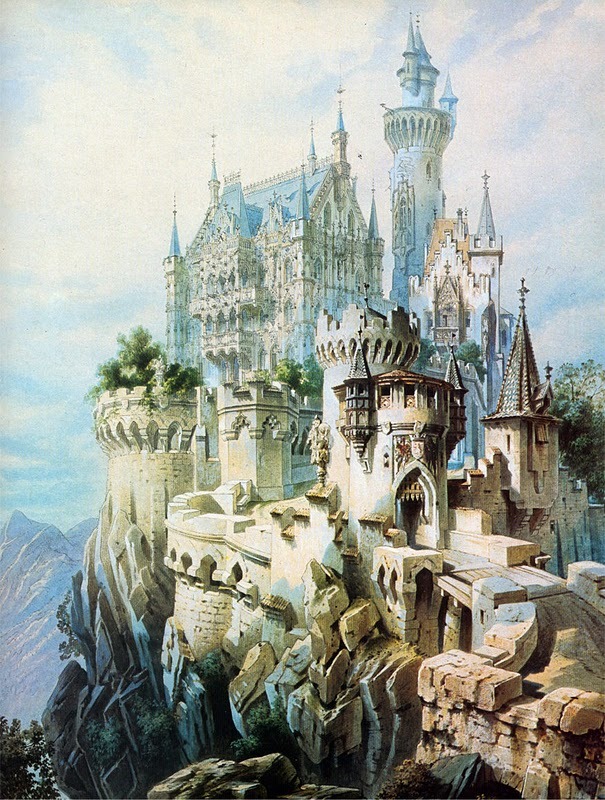 Artist and illustrator William Eaken was a marvellous choice to give Castle Falkenstein its dream-like, heroic, refined look. Eaken was also from the video game industry, and had worked for Sierra Online, LucasArts, as well as independent contracts for Rhino Records, Paramount Pictures, Steven Spielberg, NASA, etc. His pencil, oil pastel, and watercolour style was a perfect fit for the art of Christian Jank, who conceived the original (and never-built) Falkenstein Castle in our own world. Since then, he has produced illustrations for a variety of video and tabletop games, as well as fine art pieces. But for me, he will always be “the Castle Falkenstein artist.” His impact on the wonder and affection which the game generated in the hearts of fans cannot be overstated. 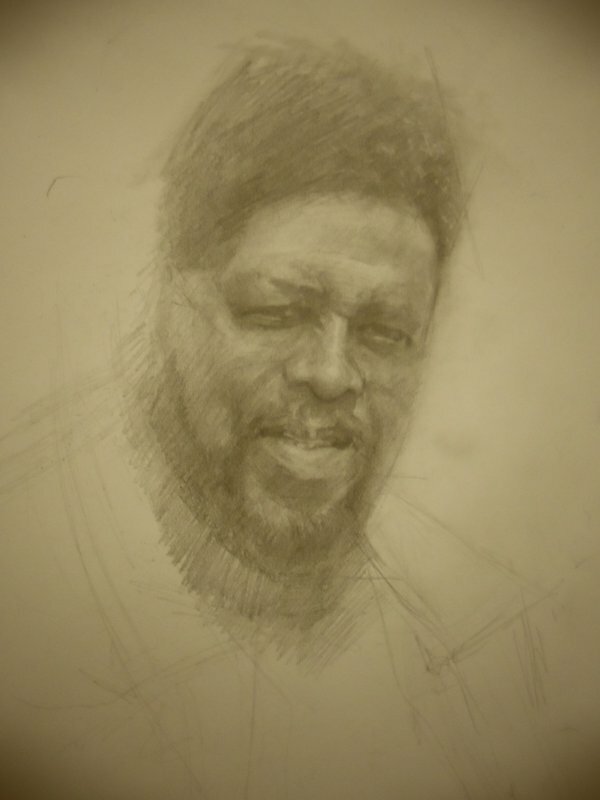 Images: Portrait of Mike Pondsmith by Eduardo “LiquidCyberpunk” Santiago, and self-portrait by William Eaken. Used without permission, no copyright challenge intended.